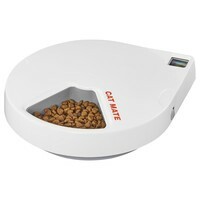 The Cat Mate C500 Automatic Pet Feeder is an easy to use product that will reliably feed your pet when you are away – during the day, evenings or over the weekend. Suitable for feeding both wet and dry foods, the C500 Feeder has 5 large food compartments that each hold 330g of wet food (or the equivalent volume of dry food) which is enough for 2 cats or 1 small dog. Refrigerated with twin ice packs and a close-fitting lid to keep the food fresh, the Feeder is easy to program and once set all the programmed feeds are visible on the LCD display. The rotating lid and 5 food compartments are easy to clean and are dishwasher safe.